Cadwell Park was the location for round 8 of the bemsee 2013 season. 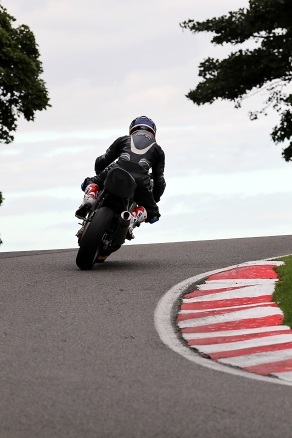 I came to cadwell and watched the previous year and it was that visit that convinced me I wanted to complete in the minitwins. This track was another first for me and after the weekend I rated this as my second favourite track after Donington. Saturday started out wet. In the first or second qualifying session someone rode nearly the entire circuit with a broken oil cooler pipe, they deposited oil on the racing line pretty much all the way round and that was the end of the morning’s racing. It waasnt until lunch time that the track was clean and dry enough to race. My Qulifying lap was a 2:04.439 this placed me in 33rd on the grid as the 13th rookie. I finished the first race in 30th as the 10th rookie. My fastest lap was a 1:55.422 which was 9 seconds faster than my qualifying lap. The second race on saturday was the carried over race from the canceled round at snetterton in march. I lined up for this in 22nd as the 4th rookie. I finished this race in 22nd as the 8th rookie. MY fastest lap was a 1:56.822. Sunday started out wet and windy. I started the first race in 30th as 10th rookie and finished in 23rd as 8th rookie with a fastest time of 2:06.203. I left early on sunday as the drive home was in excess of 5 hours with a caravan behind us, so I didnt start the second race on sunday. Unfortunately we broke down on the way home and the 5 hour drive was more like 9 hours. By the end of this weekend I had completed a total of 25 races with 23 top ten rookie finishes and improved my laptime by nearly 25 seconds.